Explore our 3-minute product demo to get a better look at Marketing Campaigns. 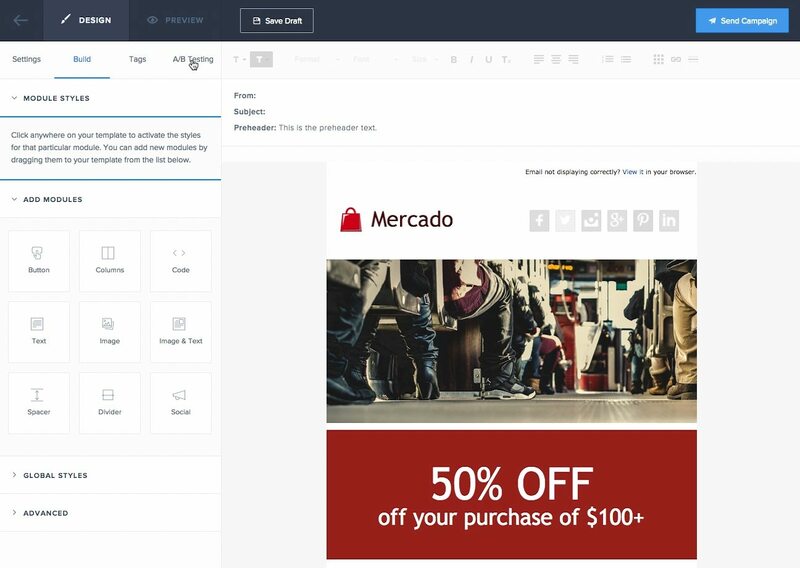 An email builder with design options that work the way you do. 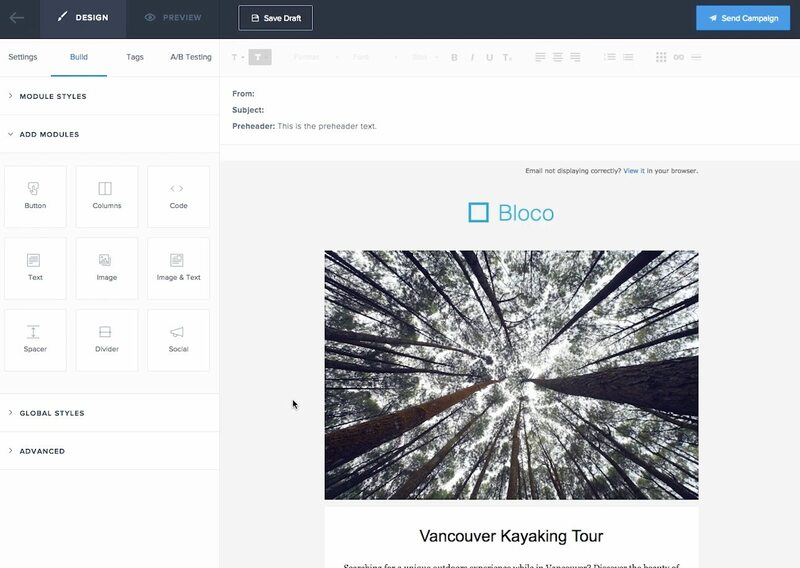 Build responsive emails from the design editor, or choose from our library of responsive email templates. Use our simple, user-friendly interface to build your best email marketing campaigns free from the inconvenience of rigid step-by-step wizards. Efficiently make adjustments as you clarify your campaign vision. Say “goodbye” to “batch and blast” campaigns. We make it simple to send marketing emails that are targeted, relevant, and wanted. Easily add your contact lists via CSV upload, or use the Contacts API to automatically add new subscribers as your base grows. Confidently create dynamic segments based on customer data and campaign engagement. Personalize your emails using custom fields to add recipient-specific data. Easily test variations within a single email marketing campaign to discover what recipients respond to best. A/B test changes to subject lines, images, links, copy, call-to-action placement, and more. Run up to 6 variations simultaneously. Let SendGrid automatically choose and deploy the winning variation or select a winner manually. See detailed reporting about each variation after your campaign is complete to inform your email marketing strategy. Understanding email marketing campaign performance is critical to optimizing engagement and demonstrating results. With our email marketing solution, key metrics are at your fingertips. Track sends, delivery rates, bounces, spam reports, click-through rates, open rates, unsubscribes, and more. Measure engagement across devices, geography, platforms, ISPs, inbox providers, and more. Set up custom categories for email campaigns to monitor performance against your unique priorities. Leverage our Event Webhook to download all stats to your systems in real-time. For your message to resonate with your customers, it first needs to reach the inbox. With SendGrid as your email service provider, you benefit from world-class technology and personal attention from email experts. Benefit from SendGrid’s relationships with top ISPs and proven throughput. SendGrid can power your entire email program at scale, whether you send emails with Marketing Campaigns or programmatically over our Email API. You’ll be delighted, and your developers will too. Manage your marketing email, such as email newsletters, and transactional email, like purchase receipts, from a single platform for ease and continuity. Have total visibility and editing access to your transactional templates. Developers love SendGrid with our best-in-class APIs, ease of integration, and interactive documentation for developers. We’re a people-first email provider, with experts who live and breathe email so you don’t have to. Tap into the world’s largest team of deliverability experts to help you win your way to the inbox. Know our 24/7/365 Support Team is dedicated to your success. Leverage a variety of expert services to expedite your success. SendGrid is critical to our business. Not only is it cost effective, but being able to visualize opens, clicks, and device usage is awesome, and makes pinpointing issues much easier. With the help of Marketing Campaigns, we feel like we have an entire creative department behind us. Nothing we’ve ever used has been this powerful in creating impactful messages to our customers. Marketing Campaigns is an extremely useful tool to have as a marketer because you can test just about any assumption you have very quickly and with very little friction and no dependencies.